Last week my husband Jon became a grandfather … sort of. He’s not exactly a grandfather, but yet in a round about way he could be considered one. It’s rather complicated but here goes. In Jon’s previous marriage, he had a stepson. Ethan. Jon first met Ethan when he was a tiny toddler, and married his mother when Ethan was around two. For the next twelve years, Jon raised Ethan as his own son. Jon taught him how to throw a football, ride a bike, and drive a car. He was there for boy scout camp-outs and the time Ethan was taken to the ER to have a cast put on his broken arm. Cheering. Disciplining. Worrying. Praying. Jon did the same sorts of things for Ethan that all good dads do for their sons. I’m sure you see what’s coming. It’s fairly obvious. Since I’m now married to Jon (and I’m not Ethan’s mother) it is rather clear at some point Jon’s marriage to Ethan’s mother failed. In the spring 2008, Ethan’s mom had to leave her marriage to Jon (for reasons I will not get into on this blog). As with any divorce, Ethan and his two younger half-sisters went through some difficult experiences during this time. In the end, a judge decided both girls would live full-time with Jon, while Ethan, who was 14 years old, would be allowed to live with his mother. By the time Jon and I had begun dating in the late fall of 2009, Ethan’s visits to Jon’s home had become sporadic at best. It wasn’t long before Ethan’s visits ceased altogether. Eventually Ethan did not want to see Jon at all, which hurt Jon deeply though he did his best to hide it. It became clear Ethan was angry with Jon for some unknown reason. All of Jon’s attempts to reach out to Ethan seemed to have little affect. For the past four years, Jon has had very limited contact with Ethan. On rare occasions, Jon might see Ethan briefly when he dropped off his daughters to see their mom. But even in those short moments of contact, Ethan greeted Jon with an awkward reception. Jon, not wanting to push Ethan further away, tried to give him space and time to work through his emotions. He ached to do more than send birthday and Christmas gifts. He longed to do more than pray for the boy he loved like a son. And yet, how do you show love to someone who doesn’t want your love? And as for Ethan … well, after a year or so, he no longer appeared to be angry, but more unsure of how to make amends. The longer the rift was there, the harder it seemed to build a bridge to cross over the gulf separating the two from each other. Last fall we heard the news second-hand. Ethan, now a high school senior, had gotten his girlfriend Marlee pregnant. Jon and I were thankful to learn Ethan and his girlfriend were planning to have their baby, and that Ethan immediately began to assume responsibilities for taking care of his girlfriend and their baby. Last Thursday, Ethan’s girlfriend gave birth to their baby, a sweet boy they named Noah. Of course, Jon’s two girls were over the moon with excitement. As soon as they heard the news, there began to be a flurry of excitement, as they were eager for their mother to come get them so they could go to the hospital and hold their new nephew. Squeezing my hand, Jon’s eyes lit with recognition. With an air of certainty, he said, “I’ve got to text him. Maybe he will let me come see the him and Marlee and the baby at the hospital.” I could tell Jon was only barely hopeful at this thought, as if he anticipated he might be denied the privilege. Soon a text message was sent, and fortunately the reply was quick. Ethan agreed to a hospital visit the following day. A look of relief washed over Jon’s face. I don’t know if I have ever seen a happier father than Jon in that moment. From the start, Jon was smitten. I knew he would be. After all, a baby is a baby, and there is nothing more precious than newborn just hours old. We met Ethan by chance in the hallway, where we spent a few moments just catching up. While their reunion cannot exactly be described as joyful or warm, it wasn’t completely awkward either. As he had hoped, Jon found a way to express some key thoughts to Ethan without becoming overly sappy or emotional … how proud he was of Ethan for choosing to do the right thing in a difficult situation, how he loved him, and how he would always be there if Ethan ever needed anything. Moments later, we walked into the small hospital room, meeting the young mother for the first time. I’ll never forget Marlee’s sweet smile as she asked Jon if he would like to hold the baby. And boy, did he! He scooped that tiny 8 lb bundle of joy into his arms. Jon looked down at the baby with the same expression I’ve seen on many a proud grandfather’s face. Jon and I left the hospital encouraged. Ethan was open to us being there, even accepting our invitation to celebrate his birthday (hopefully with mother and baby too) at a restaurant at the end of the month. We have hope the relationship between Jon and Ethan will be restored. Perhaps you are wondering why this post is titled Pushing All The Wrong Buttons. Well, give me a minute … I’m getting there. You see, when Jon and I were leaving the hospital, I had trouble figuring out how to get out. To leave the mother/baby ward, you had to push a button to open the doors. I kept pushing the button on the wall next to the door. It was clearly marked PUSH TO OPEN. Yet each time I pushed it, nothing happened. Finally a nurse on the other side of the door indicated that I should actually be pushing a different button, one that was unmarked as well as farther away from the door we were trying to exit. Once I pushed the right button, we were able to walk through open doors with ease. Moments later, we stepped onto the elevator. I pushed the button I thought was marked with a 1 for the first floor. Nothing happened. I pushed it again. Still no movement. It wasn’t until I went to push it the third time that Jon noticed the button I had been pushing all along didn’t really have a 1 on it after all. Again, once I finally pushed the correct button, the elevator immediately began to move. All I wanted to was to be able to leave the hospital. But none of the buttons I pushed would let me out. That is … not until someone showed me the right buttons to push. All Jon has wanted is to restore his relationship with Ethan. No matter how hard he tried, nothing seemed to work. That is … nothing worked until God showed Jon the right way to begin to restore the relationship with Ethan. Have you ever been in a situation where you felt like you lost something you treasured? Perhaps it was a relationship or a particular circumstance in life. Maybe you’ve lost financial security, health, or even a combination of things. When my first husband unexpectedly walked out of our 14 year marriage, I lost more than just a husband. I lost financial security, the ability to homeschool my children, the privilege of staying at home to focus on being a mom. For a period of time, I “pushed buttons” in an effort to not lose these things in addition to my marriage and my husband. I didn’t understand why God allowed me to lose them. I had no idea of how to get them back. All I knew is whatever I tried didn’t work. 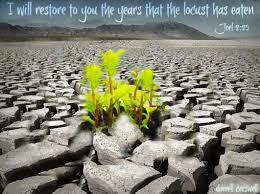 I will restore to you the years that the locust has eaten. I think God still likes to do this for His children now. He loves to give us back what we have lost. It might not look the quite the same, but so often we find at some point in our future the thing we feared was gone forever has been returned to us. After my divorce, my children had to go to public school and later a private school. Three years later, I married Jon, and to my delight the Lord blessed again me again with the privilege of homeschooling my children. It is because of this essence of God’s character that I have hope for Jon to find that his relationship with Ethan will one day be fully restored. Ethan may never again call him “Dad” and perhaps Noah will never quite look to him as a grandfather … but because God is always actively working and moving in the lives of His children, I continue to believe in the hope of restoration. What has God restored to you? How has He been faithful to you in the giving you back the years eaten away by the locusts? It is hard to have strained relationships with children, isn’t it? I’ll keep you and your daughter in my prayers, for there truly is hope in God for a full restoration. As for Ethan … I think it could be very likely that you are right, though not knowing him well or having much contact with him it would be hard to say. It’s got to be difficult for children to feel torn between parents. Truly, Jon’s hands were tied as he was not biologically the father of Ethan. My prayer continues to be that there will be forgiveness and a new relationship, and I am so thankful for that hope in Christ! I’m here crying, as it hit me why The Lord is calling me back into blogging. We can go deeper here than ever possible on Facebook. I have been ‘friends’ with you since FIAR and lived your divorce with you and celebrated with you when you met Jon. So, I’m very happy that you posted your blog link and that I can follow you this way. What a beautiful glimpse into your heart and what a wonderful man that God had in mind for you. God bless!! !